In the present work our goal was to explore the prodrug approach study especially for colon targeting antibacterial agents. We choose the sulfonamides as an antibacterial agent for colon targeting treatments. For this purpose sulfonamides were coupled to carvacrol through azo compound formation. The newly synthesized azo compounds were characterized by spectral techniques such as Infrared (IR), Proton Nuclear Magnetic Resonance (1H-NMR) and Carbon-13 Nuclear Magnetic Resonance (13C-NMR). The drug released study of the parent compound was done by in vitro enzyme degradation by using azoreductase enzyme which was secreted by pseudomonas aeruginosa bacterium. Carvacrol and its derivatives were known show remarkable biological activity such as antimicrobial, antitumor, antimutagenic, antigenotoxic, analgesic, antispasmodic, anti-inflammatory, angiogenic, antiparasitic, antiplatelet, Ache inhibitory, antielastase, insecticidal, antihepatotoxic and hepatoprotective activities. However sulfonamides were also the most effective agent against most of the bacteria. The parent drug release was confirmed by the new spectral technique HPTLC. The combine formulation of sulfonamide and carvacrol as azo compounds gives the new tool for colon targeting agents as well as for urinary tract disorders, and they can also find new varieties of applications in the field of medicinal and pharmaceutical chemistry. Prodrugs, Carvacrol, Azo compounds, Sulfonamide, Enzyme degradation. Prodrug is a newer category of drug, which are inactive forms of drug, but can be biotransformed into active form in vivo by means of enzymatically or chemically . The term prodrug was first introduced by Adrien Albert in 1958, for the compounds which are biologically inert derivatives of drug molecule that undergo conversion in vivo to release active ingredients . A prodrug can be used to get better drug delivery action, pharmacological activity and pharmacokinetics of a parent drug molecule. It also used for lowering the toxicity of parent drug towards specific cells or tissue . Even though the prodrug design is very difficult aim, still it is more realistic or quicker than developing a new therapeutic drug molecule with desired absorption, distribution, metabolism, excretion and toxicity . Nowadays there are two types of prodrugs are available Type-I and Type-II. Type-I includes, prodrugs which are converted into active form intracellular and Type-II includes, prodrugs which are converted into active form extracellular particularly in digestive fluids or systematic circulation . Prodrugs are site-specific or target specific in nature. They help in accurate and direct effects at the specific site without harming the remaining tissue. Most of the prodrugs are design for increase in lipophilicity of a parent drug molecule, results in the transportation of the parent drug passively to all tissue . Chronic hepatitis B (HBV) is a growing problem in most of the countries. HBV infects the liver and patients are at a higher risk for cirrhosis and cancer of the liver. Tenofovir is the current standard treatment for HBV. However, it is not completely effective at everlastingly suppressing HBV replication. CMX157 is the prodrug of Tenofovir was developed for solve this problem . An Oridonin is a terpenoid with low solubility in water whose activity becomes superior by the use of prodrug approach. Oridonin is a natural product found in Rabdosia rubescence, a chinese medicinal plant and it possess outstanding antitumoral property against several types of malignant cells, including leukaemia also . The use of prodrug method has shown more impact on the advancement of capable nucleoside and nucleotide antiviral therapies, where it gives enormous expectation for patients suffering from deadly viral diseases such as HIV, Hepatitis-B . Thus, the prodrug design is an area for researcher who is dedicated to optimize drug delivery study, where the parent drug is masked by the pro-moiety and transported at specific site or target site and then release the parent drug within the body . Carvacrol is a naturally occurring monoterpenoid found in essential oil of origanum Vulgare, oil of thyme. About 75 % of the total volume of thyme oil is rich in carvacrol . It is an isomer of thymol which is also a monoterpenoid. Carvacrol suppresses enzyme COX-2 (cyclooxygenase-2) appearance, which is primary cause of redness and swelling . Carvacrol used as cleaning agent instead of chlorine on the fruits, because most of the fruits are infected by salmonella and it is observed that, the use of carvacrol solution over these fruits shows significant reduction in salmonella . Carvacrol inhibits the copper-induced oxidation of LDL Cholesterol, results in no accumulation of cholesterol along the artery walls . Carvacrol also lowered the blood sugar level in humans without any side effects . Carvacrol is also accountable for the biological activities such as antimicrobial, antitumor, antimutagenic, antigenotoxic, analgesic, antispasmodic, antiinflammatory, angiogenic, antiparasitic, antiplatelet, Ache inhibitory, antielastase, insecticidal, antihepatotoxic and hepatoprotective activities . Now a day carvacrol is used as food flavouring ingredient and preservatives in low concentrations, in addition to this it also used as fragrance ingredient in cosmetic formulations . Carvacrol has also been shown to protect DNA from damage and prevent cancer cell replication. In some studies it is shown that carvacrol can make apoptosis (cell destruction) in cancer cells . Carvacrol has highest activity against E. coli because of this, carvacrol may be suggested to use routinely to promote gastrointestinal health and to avoid deadly food poisoning . Azo compounds are the compounds having general formula R-N=N-R' or Ar-N=N-Ar'. Azo compounds forms a new class in synthetic organic chemistry which possess various applications mostly as dyes and pigments. The name azo comes from azote, which is french name for nitrogen derived from the Greek, a=not and zoe=to live . Azo compounds are purely synthetic colouring compounds and they do not occur naturally. About 60-70 % of azo compounds are used in the field of food and textile manufacture. Now a day azo compounds are also used in the field of medicinal chemistry . Azo compounds exhibits various properties including antibacterial and antifungal, they are also inhibitors of proteases (enzymes that play functions in many pathological disorders) . The azo derived synthetic products shows versatile biological activity in drug discovery and drug release study such as antioxidant activity, cytotoxic activity, anthelmentic activity, Cholinesterase inhibitory effect, wound healing activity, analgesic activity, anti rheumatoidal activity . The quinoline based azo compounds in the form of ligands enhancing therapeutic effect when they were used in the formation of chelates with transition metallic ions. This quinoline based azo compounds exhibits the anti-HIV property, wound healing activity . It has been also seen that, carvacrol Influences the growth and toxin production by Bacillus cereus . Cox et al. studied and reported that; carvacrol permeates the outer membrane of pseudomonas aeruginosa . Carvacrol also acts as a toxic substance to cell membranes of some bacterial species such as Staphylococcus aureus, Salmonella enterica serovar Typhimurium, Pseudomonas fluorescens, and Brochothrix thermosphacta . Carvacrol also exhibits good antibacterial efficacy against gram positive bacterium such as Staphylococcus aureus .One of the important use of carvacrol is, it suppresses the Cox-2 expression . The azo compounds are metabolized in the colon, where it degrades in to two aromatic amines by means of reduction of azo (-N=N-) bond, using azo reductase enzyme which is secreted by colon microflora. The azo compounds are also used as great tool for development of colon targeting agents in which bacterial infection of colon can be minimized. Azo compounds can also be used in the IBD or Crohn's disease. IBD means intestinal bowel disease, involves chronic inflammation of all or part of digestive tract. It is a primary type of ulcerative colotis. Crohn's disease is an IBD that causes inflammation of the lining of digestive tract. IBD or Crohn's disease caused by a condition when our immune system tries to fight off against bacterium, an abnormal immune response causes the immune system to attack the cells in the digestive tract. Indirectly we can say that, bacterial infection in digestive tract or in colon is caused for the IBD or Crohn's disease . Due to increase in microbial infections, our attention has been forced us for development of new antimicrobial compounds and investigate their drug activity. 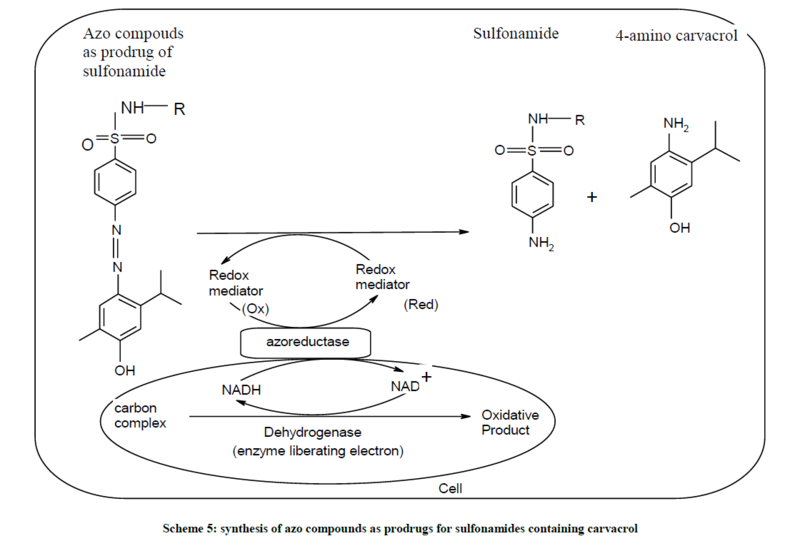 Hence we choose the prodrug approach for this purpose containing synthesis of azo compounds of sulfonamides and carvacrol to improve the antimicrobial activity of sulfonamide as well as carvacrol. We also studied the drug release study for the newly synthesized azo compounds. Pharmaceutical grade sulfa drugs (Ishita Drugs & Pharmaceuticlas, Ahmadabad, Gujarat, India.) sulfathiazole and sulfacetamide were used, sodium nitrite, sodium hydroxide and carvacrol from SD fine chemicals ltd. Mumbai, India. All other reagents and solvents were of analytical grade. The compounds were characterized by Infrared (IR), Proton Nuclear Magnetic Resonance (1H-NMR) and Carbon-13 Nuclear Magnetic Resonance (13C-NMR). The melting points were determined by open capillary method and are uncorrected. The IR spectra were recorded on Perkin-Elmer spectrum-one FTIR instrument in the form of KBr pallet. The 1H-NMR and 13C-NMR were recorded in DMSO on a BRUKER AVANCE II 400 NMR spectrometer using TMS as an internal standard. The purity of synthesized azo compounds was checked by TLC. The crude products were recrystallized from ethanol. Sulfonamide (sulfacetamide, 2.14 g, 0.01 mol) was mixed with conc. HCl (2.5 ml).To the resultant suspension crushed ice (25 g) and NaNO2 (2.5 ml, 4 N) was added with constant stirring. Diazotization was carried out over 0.5 h at 5ºC and then diazonium salt solution was added drop wise at 5ºC-10ºC to the alkaline solution of carvacrol (Scheme 1). The coupling reaction mixture was stirred for 0.5 h and the pH of the resultant mixture was adjusted to the pH 7. The formed azo colored compound was filtered, washes with water and dried. Crude products were recrystallized with ethanol as solvent (Scheme 2). P. aeruginosa was isolated from industrial effluent water samples collected from Disan Agro Ltd. Dhule (MS) India by spreading diluted sample from 10-5 dilutions over a sterile Cetrimide Agar plate (gl-1 Enzyme digest of Gelatine-20 g, Magnesium chloride-1.4 g, potassium chloride-10 g, Cetrimide (Cetyl tri methylammonium Bromide), -0.3 g, Glycerol-10 ml, pH-7.2) and incubated for 24 h at 37°C in an incubator. The isolated P. aeruginosa strain was tested for de-colorization activity against newly synthesized azo compounds (0.250 g/l) in nutrient broth (gl-1 Peptic digest of animal-5 g, Sodium chloride-5 g, Beef extract 1.50 g, Yeast Extract-1.50 g, pH-7.4) by inoculating with loop full bacterial culture. These flasks were incubated at 37°C for 24 h. Un-inoculated flasks served as controls to assess the abiotic de-colorization. 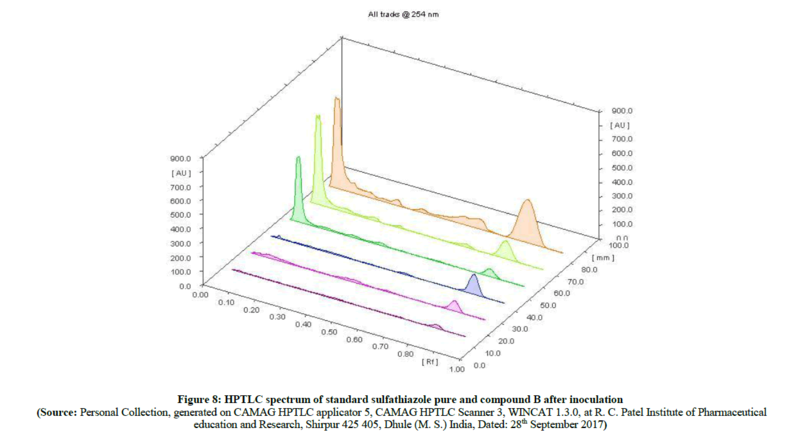 Optical densities values were measured spectrophotometrically at 427.3 nm and 432.5 nm respectively for the estimation involving de-colorization process. 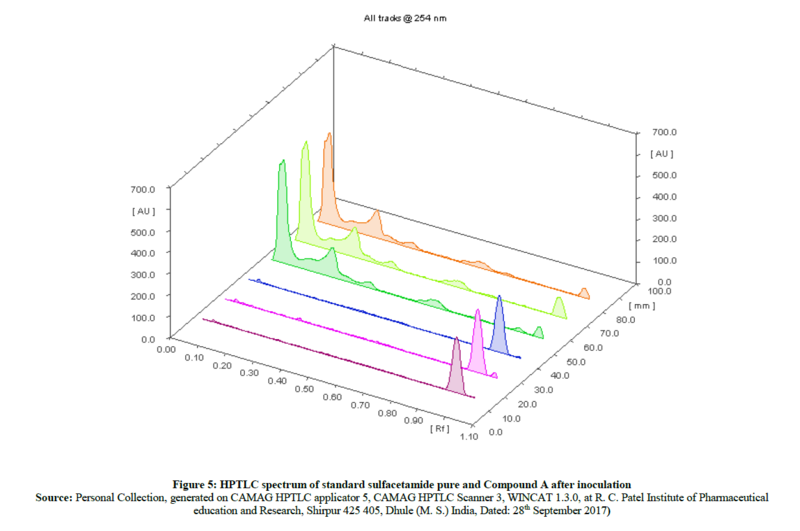 After reduction of azo compounds into primary aromatic amines, that newly formed primary aromatic amines were identified by HPTLC technique by comparing with pure sulfacetamide and sulfathiazole as standard. The melting points were determined by open capillary method and are uncorrected for pressure effects. The 1H-NMR spectra (Figures 1 and 2) reveals that, there is a slight shifting of chemical shift of aromatic protons of carvacrol to down field. This is because of the formation of azo (-N=N-) linkage between sulfonamide and in carvacrol compound A, Compound B which is a electron withdrawing group. 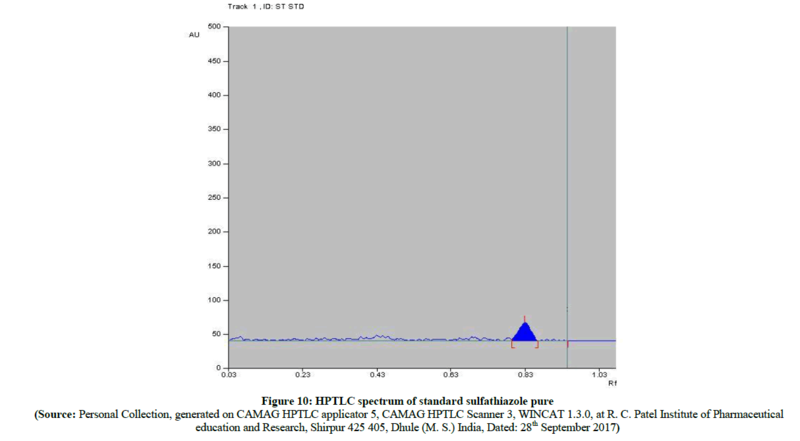 The investigation of 13C-NMR spectra (Figures 3 and 4) shows that, the diminishing of the doublet peak of –C= which is at para- position to the -SO2- in sulfonamide, generally occurs with a shift value of 127 ppm. After coupling of carvacrol in compound A and compound B with, -C= which is at para- position to the -SO2- in sulfonamide shows the shift at singlet near about 159.80 ppm in all new synthesized azo compounds respectively. The synthesis of prodrugs of sulfacetamide and sulfathiazole was carried out by diazotization method and coupling with carvacrol. The melting points, yields and spectral properties data are summarized in Table 1 shown below. 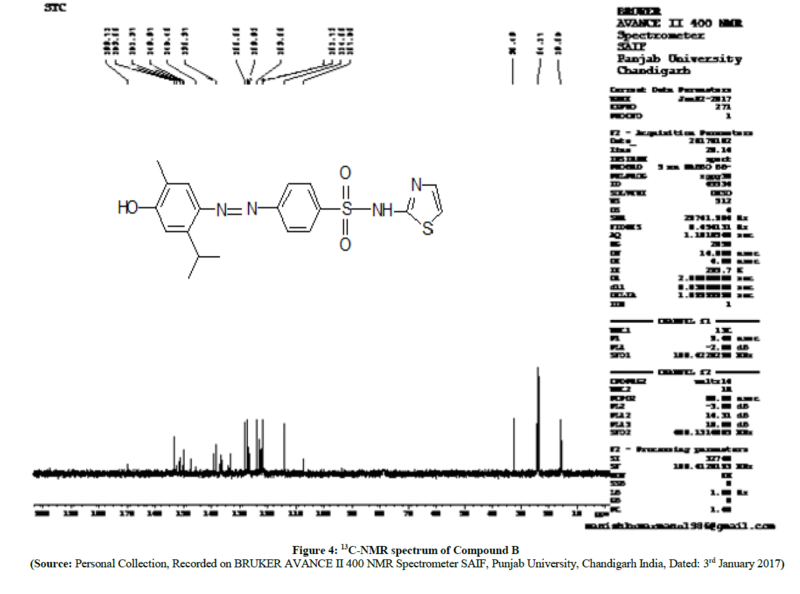 The structures of newly synthesized azo compounds were confirmed by IR spectra (DMSO as solvent), 1H-NMR spectra (duterated DMSO as an internal standard) and 13C-NMR (duterated DMSO as an internal standard) spectral characterizations (Schemes 3 and 4). 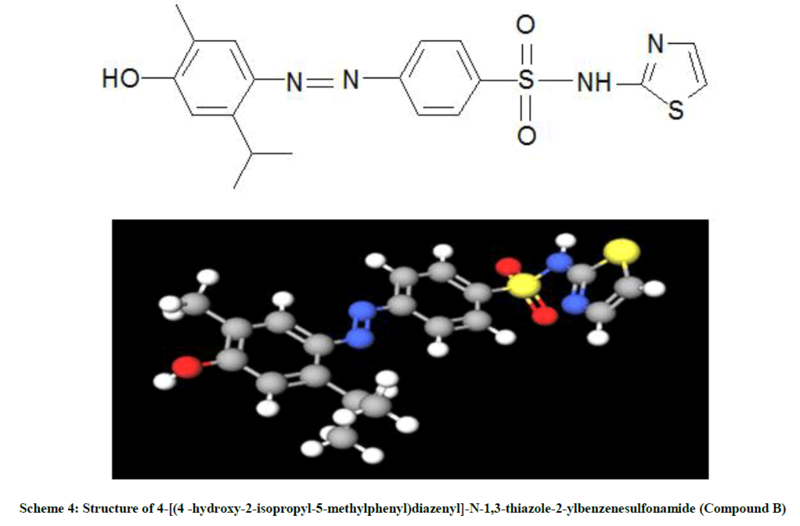 Compound A, compound B were found to have maximum absorption at λmax=427.3 nm, 432.5 nm respectively in UV-visible spectrophotometer as solution in DMSO. 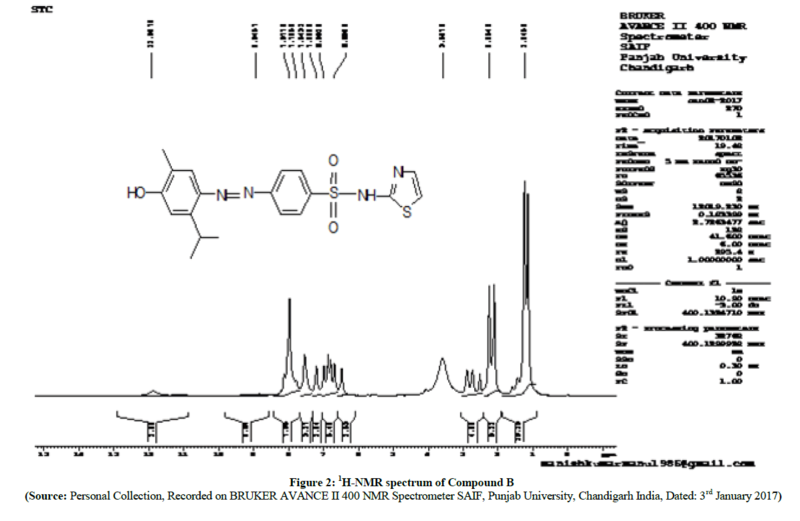 It confirms the formation of azo linkage –N=N-, and exhibits IR peak at 1579.75 cm-1 and 1581.68 respectively for compound A and compound B. 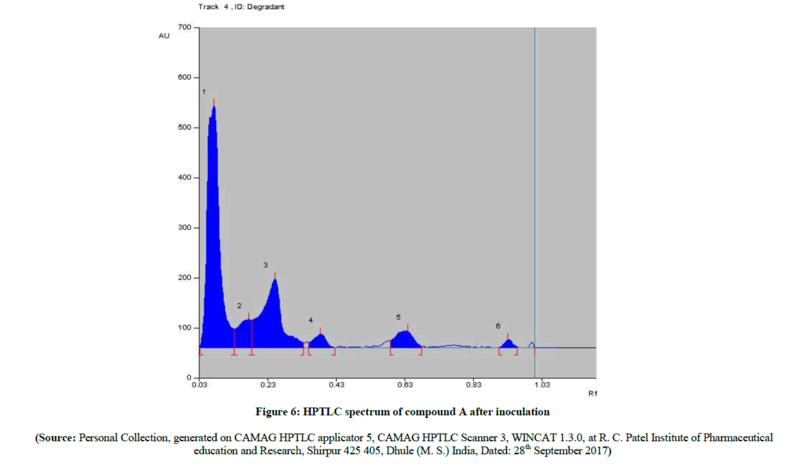 The HPTLC spectra (Figure 5) of newly synthesized azo compound A after inoculation is compared with pure parent drugs i.e. with sulfacetamide. 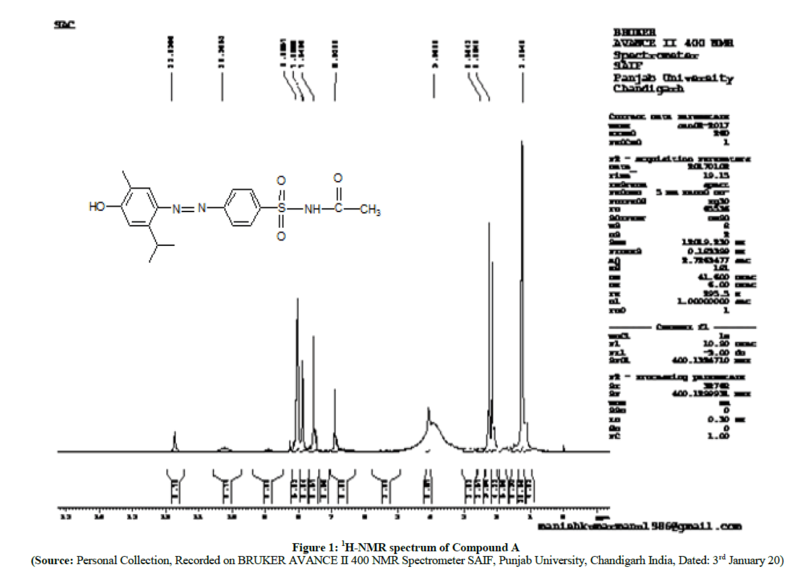 The HPTLC spectra of compound A (Figure 6) clearly shows that, the Rf value of pure sulfacetamide is at 0.93 (Figure 7) which is matched with Rf value of released drug from synthesized azo compound A after 24 h of inoculation of P. aeruginosa bacterium species. 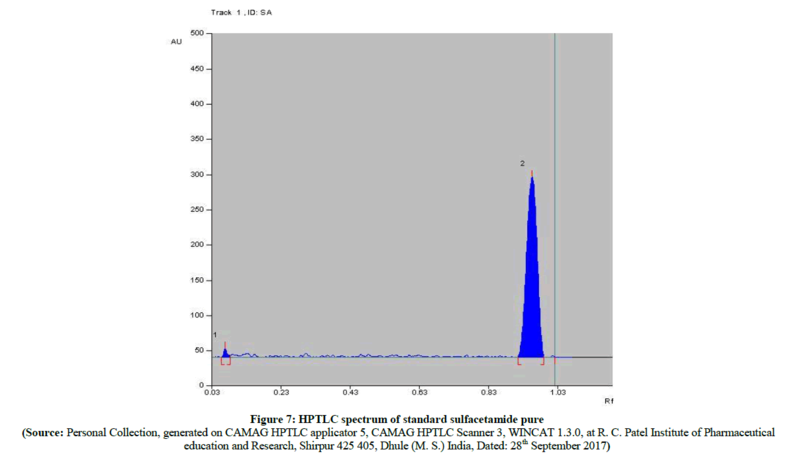 Comparable HPTLC (Figure 5) spectra indicates first three peak lines for pure sulfacetamide drug of concentration 1 μl, 1 μl, 1 μl and next three peak lines for drug obtained after degradation of azo of compound A of concentration 1 μl, 1 μl, 1 μl were match excellently. The HPTLC spectra (Figure 8) of newly synthesized azo compound B, after inoculation is compared with pure parent drugs i.e. with sulfathiazole. The HPTLC spectra of compound B (Figure 9) clearly shows that, the Rf value of pure sulfathiazole is at 0.83 (Figure 10) which is matched with Rf value of released drug from synthesized azo compound B after 24 h of inoculation of P. aeruginosa bacterium species. 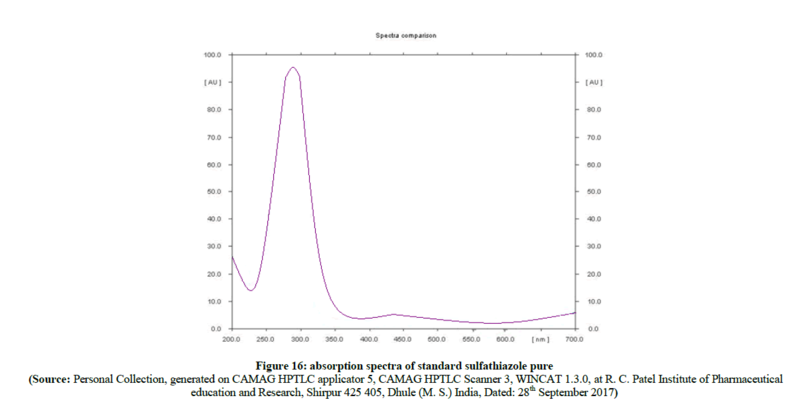 Comparable HPTLC (Figure 8) spectra indicates first three peak lines for pure sulfathiazole drug of concentration 1 μl, 2 μl, 3 μl and next three peak lines for drug obtained after degradation of azo of compound B of concentration 1 μl, 2 μl, 3 μl were match excellently. Comparable Rf values of Standard compounds sulfacetamide, Sulfathiazole, Compound A and compound B were summarized in Table 2. 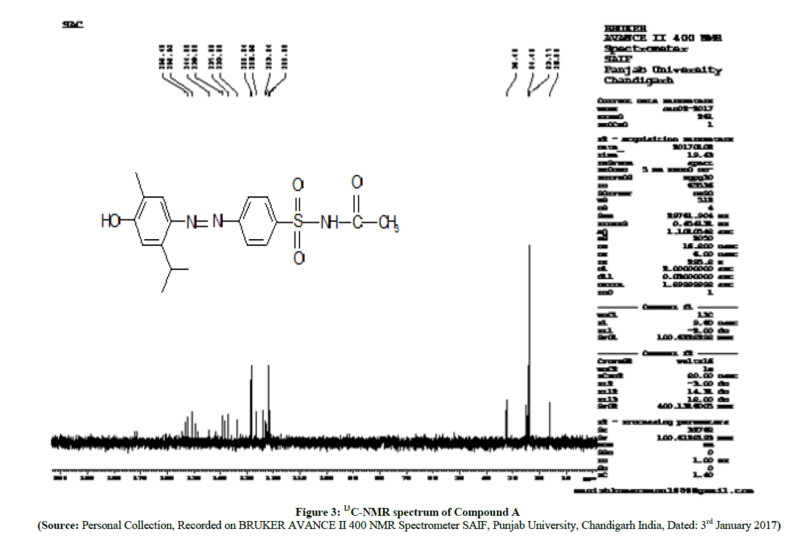 In the comparison of absorption spectra (Figure 11) of pure sulfacetamide (Figure 12) with degraded azo compound A (Figure 13), it is clearly observed that the –N=N- azo bond is cleaved enzymatically and there is a release of parent drug i.e. sulfacetamide. 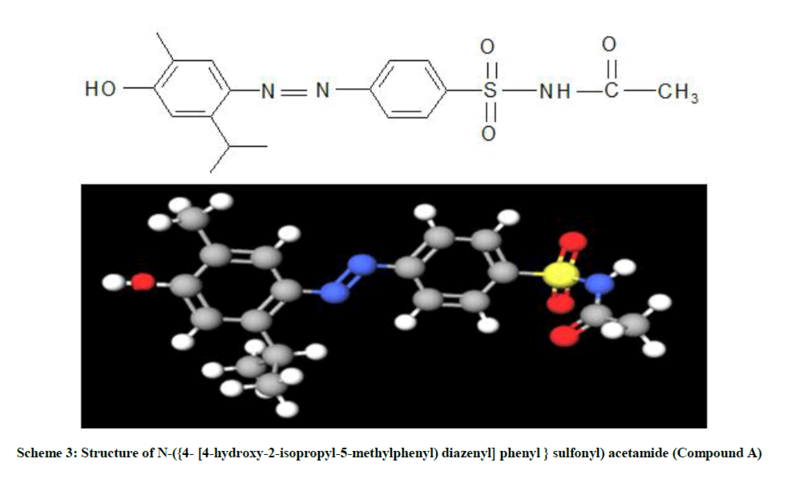 In the evaluation of absorption spectra (Figure 14) of pure sulfathiazole (Figure 15) with degraded azo compound B (Figure 16), it is clearly observed that the –N=N- azo bond is cleaved enzymatically and there is a release of parent drug i.e. sulfathiazole. Comparable absorption values of Standard compounds sulfacetamide, Sulfathiazole, Compound A and compound B were summarized in Table 3. 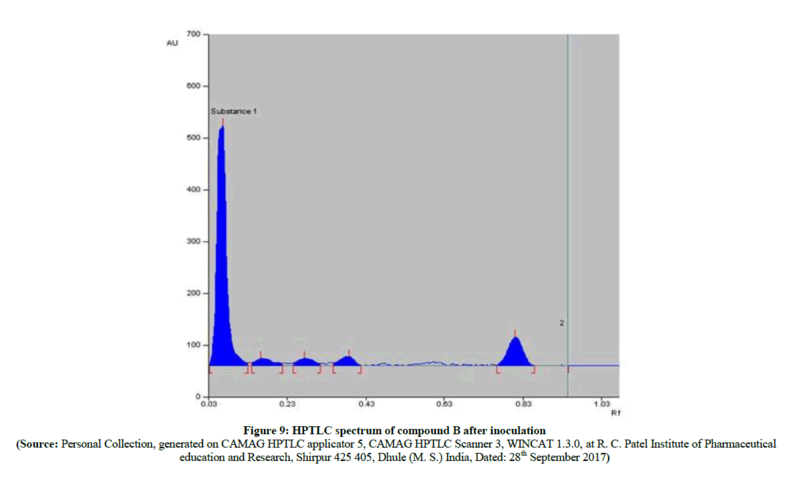 The spectral absorption intensity of λmax at 427.3 nm for compound A, λ max at 432.5 nm for compound B respectively get decreased as a function of time of inoculation of P. aeruginosa bacterium species. It means that the azo linkage (-N=N-) get breaking down as time gradually increases. The plot of intensity vs time in hours is shown in Graph 1, Graph 2 for compound A, compound B which shows that the intensity of absorption decreases as the time increases respectively. For this purpose, we subtract the 2 ml from inoculated azo compounds solution after each 2 h from each flask and recorded the intensity of λmax at 427.3 nm, 432.5 nm respectively. Intensities of absorption values at regular intervals (i.e. after each 2 h of inoculation) were summarized in Table 4 for compound A and in Table 5 for compound B. The human colon is a dynamic and ecological diverse environment containing over 400 distinct species of bacteria consisting mainly of non sporing anaerobic bacteria. A major metabolic function of colonic microflora is the fermentation of non-digestible dietary residue. The metabolic endpoint is generation of short chain fatty acids. For this fermentation, the microflora produces a vast number of enzymes, however, only two or three enzyme systems have been exploited in this area; for example Azo reductase for development of colon-specific drug delivery system. Colon is suffer from some of the disease like, Angiodysplasia of the colon, Appendicitis, chronic functional abdominal pain, colitis, colorectal cancer, colorectal polyp, constipation, Crohn's disease, Diarrhea, Diverticulitis, Hirschsprung's disease (aganglionosis), Ileus, Intussusceptions, Irritable bowel syndrome, pseudo membranous colitis, ulcerative colotis and toxic megacolon. Most of these disease are arises due to self-limited, mild infections of the colon. Particularly salmonella bacteria can contaminate with food and make infection to the colon. Similarly different types of bacteria commonly contaminated through water and food and results in infections to the colon. In order to kill these bacteria and cure from infections the antibiotic medicines may be employed. Carvacrol is compound from class terpene. Carvacrol and some its derivatives inhibits the expansion of several bacteria strains, e.g. Escherichia coli and B. cereus. Their low toxicity together with its pleasant taste and smell suggests they use as a food additive to prevent bacterial contamination. In some bacterial species they causes damages to the cell membrane and, unlike other terpenes, they inhibits their propagation. The cause of the antimicrobial properties is believed to be disruption of the bacteria membrane. They also activate PPAR and suppress COX-2 inflammation. The azo compounds i.e. prodrugs of sulfacetamide; sulfathiazole has best possible drug release for colon targeting. The results show that not only development of sulfacetamide, sulfathiazole but also the formation of 4-amino carvacrol which is useful in bacterial infection. Therefore, formation of azo compounds as prodrugs of sulfacetamide, sulfathiazole as localized delivery or control release of the drugs in the colon is beneficial. In addition to these sulfonamides in the form azo compounds are protected from the environment of upper gastro intestinal tract (GIT). The mechanism of reduction of azo compound by azoreductase enzyme was proposed by Courlesy in 1997 . Therefore, the synthesis of azo compounds as prodrugs for sulfonamides containing carvacrol moiety (Scheme 5) provided as a very powerful tool for overcome the colon infections. In addition to this, formation of azo compounds as prodrugs of sulfacetamide, sulfathiazole acts as localized delivery agent or control released agent for the colon. K.M. Huttanen, H. Raunio, J. Rautio, The Am. Soc. Pharmacol. Experiment. Therap., Pharmacol. Rev., 2011, 63(3), 750-771. B. Rita, T. Alkhilesh, J. Pharmaceut. Nanotechnol., 2015. J. King, The global 505 (B)(2) experts Camargo Pharmaceutical services. D.H. Jornada, G.F. dos santos Fernandes, D.E. Chiba, T.R.F. de Melo, J.L. dos santos, M.C. chung, Molecules., 2016, 21, 42. U. Pradere, C. Ethel, G. Amblard, S.J. Coats, F. Amblard, R.F. Schnazi, Chem Rev., Am. Chem. Soc., 2014, 114, 9154-9218. M. Hotta, R. Nakata, M. Katuskawa, S. Horik, H.I. Takahashi, J. Lipid Res., 2010, 51(1), 132-139. Y, Lu, C. Wu, J. Food Prot., 2010, 73(12), 2270-2275. T. Kulisi, A. Krisko, V. Dragovi-Uzelac, M. Milos, G. Pifat, Int. J. Food Sci. Nutr., 2007, 58(2), 87-93. E. Kemertelidze, T. Sagareishvili, V. Syrov, Z. Khushbaktova, L. Tsutskindze, R. Kurashvili, Georgian Med. News, 2012, 203, 47-52. K.H. Baser, Curr. Pharm. Des., 2008, 14(29), 3106-3119. Z.E. Suntres, J. Coccimiglio, M. Alipour, Crit. Rev. Food. Sci. Nutr., 2015, 55(3) 304-318. Craig Elding, What is carvacrol, Health cloud article. https://draxe.com/oregano oil benefits superior to prescription antibiotics. E.W. Tomczak, L. Gorecki, Chemik., 2012, 66(12), 1298-1307. J. Sahoo, S.K. Paidesetty, Asian J. Pharmaceut. Clin. Res., 2016, 9(1), 33-39. F.P. Minocheherhomji, K.K. Vidya, Int. 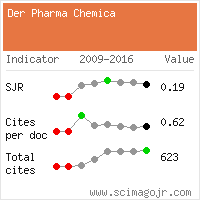 J. Pharma Biosci., 2016, 7(4), 412-415. A. Ultee, E.J. Smid, Int. J. Food Microbiol., 2001, 64(3). S.D. Cox, J.L. Markham, J. Appl. Microbiol., 2007, 103(4), 930-936. R. Di Pasqua, G.Betts, N. Hoskins, M. Edwards, D. Ercolini, G. Mauriello, J. Agric. Food Chem., 2007, 55(12), 4863-4870. M. Cristani, M. D'Arrigo, G. Mandalari, J. Agric. Food Chem., 2007, 55(15), 6300-6308. M. Hotta, R. Nakata, M. Katsukawa, K. Hori, S. Takahashi, H. Inoue, J. Lipid Res., 2010, 51, 132-139. S.M. Koshti, J.P. Sonar, A.E. Sonawane, Y.A. Pawar, P.S. Nagle, P.P. 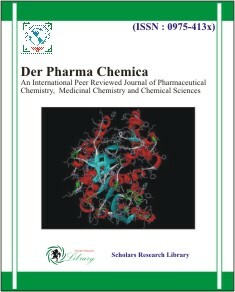 Mahulikar, D.H. More, Indian J. Chem. (Section-B), 2008, 47(B), 329-331. S.S. Shasank, K.P. Sudhir, N.P. Rabindra, Biomed. Pharmacother., 2017, 88, 181-193. P.P. Vijaya, R. Aishwaryalakshmi, N. Yogananth, M. Syed Ali, J. Adv. Laboratory Res. Biol., 2012, 3(4), 285-289. A. Keck, J. Klein, M. Kudlich, A. Stolz, H.J. Knackmuss, R. Mattes, App. Environ. Microbiol., 1997, 63(9), 3684-3690.